Hello there, from a wet and wild Cumbria! 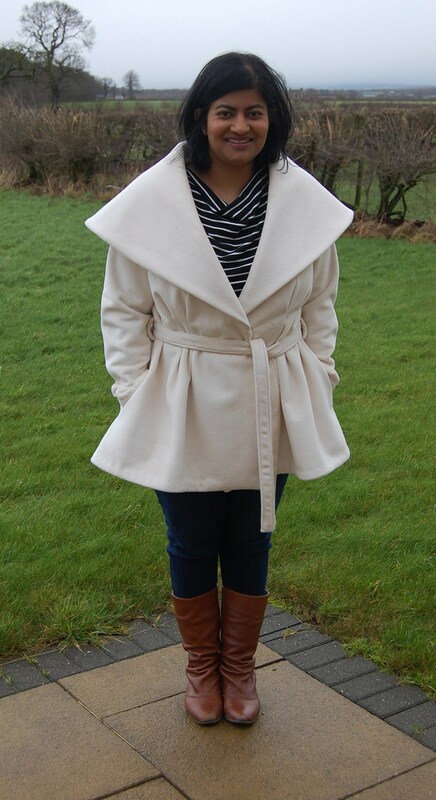 Winter is still with us, and last weekend I decided to make a coat (as you do!) I had this fabric in my stash that I picked up from my local market and I figured if I didn’t use it then it would sit there until next winter…or longer….so I decided to go for it. Let me tell you about the fabric first. It was either made by or for Barbour (the company that makes the famous waxed and now quilted jackets). It is perhaps what you might call a technical fabric? I have no idea of the exact composition. It has a nap and is very soft and strokeable. It is also double layered. By that I mean it is two layers of fabric which appear to have been glued together with a layer of foam sandwiched inbetween (so it is quite heavy and very warm). It is also water repellent. 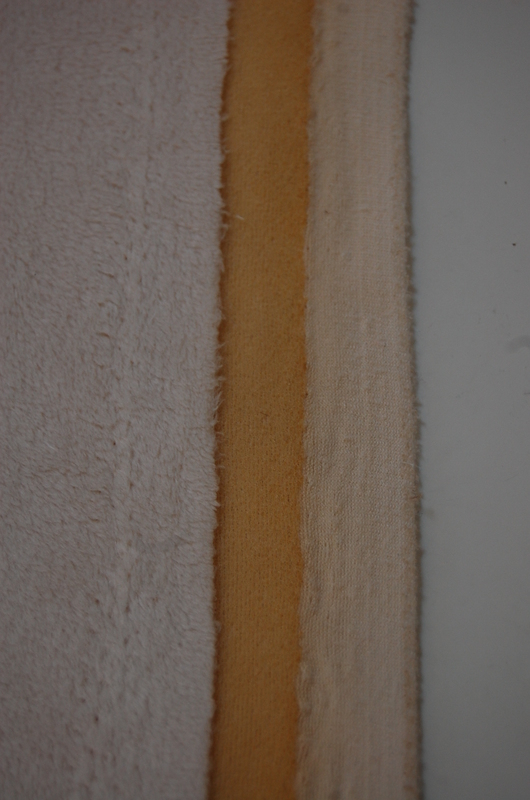 Here’s a shot of the fabric so you can see what I mean by the two layers. In case any one is wondering about the practicalities of keeping a cream coat like this clean without running up extortionate dry cleaning bills, I prewashed this fabric (I tested a sample first!). In fact, I noticed some marks on it before taking these photographs, so it is in the wash as I type. Now, the pattern. The pattern is Vogue 9037. Here’s the envelope illustration of the version I sewed (view C). The major difference you will notice is that I chose to level the bottom hem off (remember if you do this, you also have to adjust the facing pattern piece as well). It’s an easy adjustment to make if you are not fond of the shaped hem thing. This is classed as a very easy vogue pattern and it was very easy. I don’t think there was anything particularly difficult about it and the results, as you can see, are pretty dramatic. If you don’t like the oversized collar thing, this pattern isn’t for you (although there are two other more moderately sized collars included in the envelope). The one thing I wish I had done differently was adjust the collar for turn of cloth. Ah well, It’s not too obvious but a lesson learned for next time. 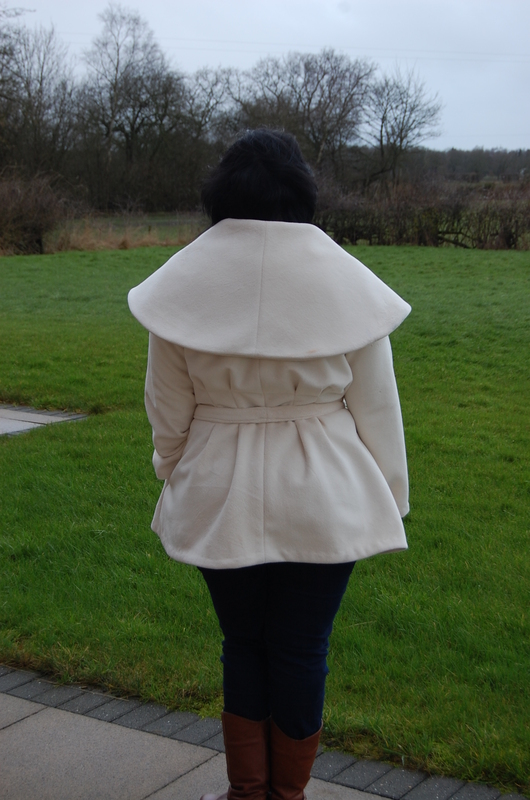 Loose-fitting, unlined, double-breasted jacket has collar variations, front and back tucks, shaped front hemline and snap closing. C: side pockets. A and C: self belt. Note: No provisions provided for above waist adjustment. I made a slightly modified view C.
Yes, I think so, although I chose to level the front hem off (remember if you do this you have to also change the facing piece as well). I love the finished effect. That is probably alot to do with my fabric (see below), but if you want a dramatic oversized collar, then this does the job.I wish I had adjusted for turn of cloth on the collar. It was either made by or for Barbour (the company that makes the famous waxed and now quilted jackets). It is perhaps what you might call a technical fabric? I have no idea of the exact composition. It has a nap and is very soft and strokeable. It is also double layered/ double faced. By that I mean it is two layers of fabric which appear to have been glued together with a layer of foam sandwiched inbetween (so it is quite heavy and very warm). There is no wrong side and it does not fray when cut. It is also water repellent. Because of the above, I wanted a pattern for a coat which was unlined. 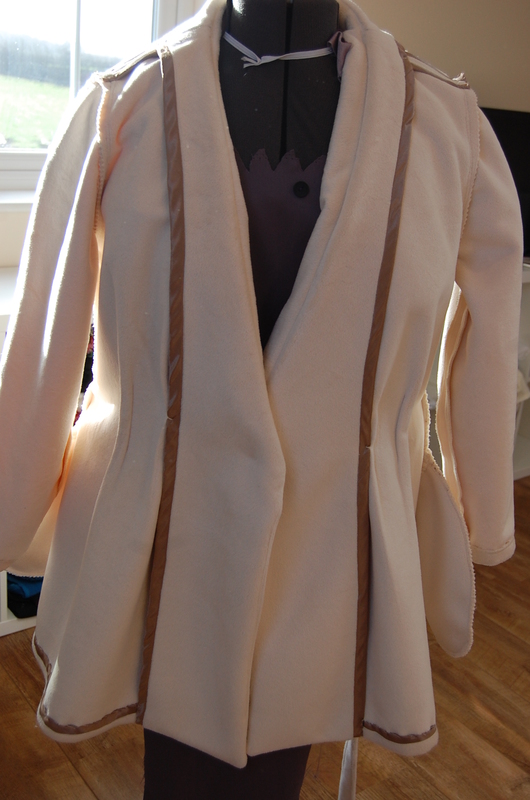 I chose to finish my jacket with a combination of a hong kong finish and pinking. I levelled the front hem and facing piece off, and added 1 inch to the lower hems. I shortened the sleeves by about an inch and did a 1 inch full arm adjustment. I hand sewed the hems. I added belt loops and some topstitching to the belt. It’s quite distinctive so probably not (maybe one of the other views?). Yes, I recommend. I feel ab fab when I wear this coat. It feels amazing on and I am sure I will get a little more wear out of this piece before packing it away until next year. Ooh, this looks cosy! I always worry about light coloured coats, but the fabric being washable solves that problem. Yep, I hate taking stuff to dry cleaners so if I am going to do winter white, it has to be washable! I love it!! That is some interesting fabric too!! Meant to say ‘your’ . Fabulous coat! Thanks Sassy T. Making coats is sooo rewarding and worthwhile! Looks incredibly cozy and warm! I love white coats. It’s so awesome that it is washable! Thanks Andie. Yes, washable white is the way to go! That big collar is fun. I am also utterly astonished at how green the grass is (as I am from the desert southwest of the US). Amazing. Thanks Anonymous. We do get a lot of rainfall here…must make the grass very green! I love the color and collar! I’ve taken this pattern out of my stash a few time and contemplated making it, never considered a wool/outerwear fabric. Great idea! That coat is the best…I love it!!!! Because Vogue has the smaller collar on the envelope, I hadn’t looked at the pattern. The big collar looks warm, cuddly and stylish!!!!! Thanks Judi. It’s a easy coat to make with maximum impact. Oh my gosh! I ADORE your coat!! That fabric is fantastic, I have this pattern and WISH I had that material to make my own. It looks great on you. 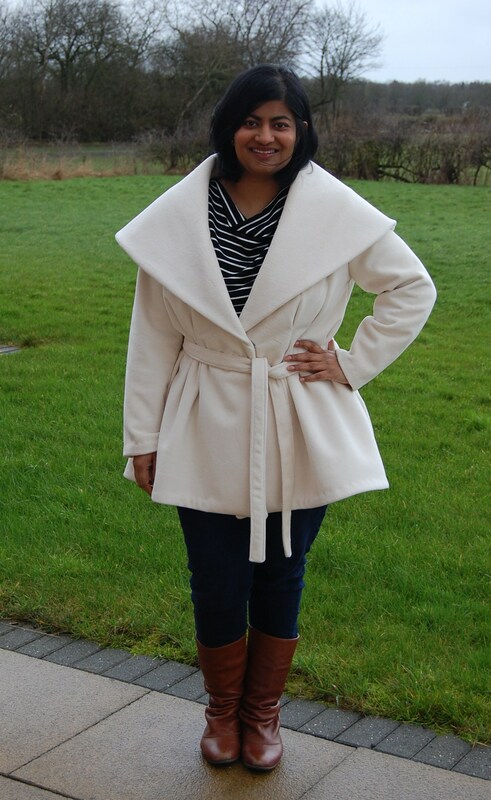 This coat is fantastic, love the dramatic colar plus white is my favorite winter colour, you need something bright right? Thanks Idaaidasewing. Winter white is just such a glam, luxurious colour to wear and stands out in all the drab, dark colours at this time of year. 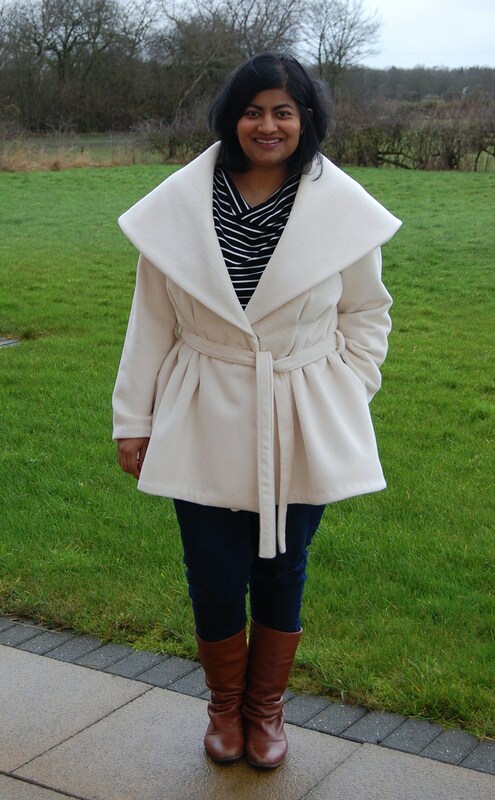 Manju, this coat is fantastic and I am so jealous of that fabric. You always have the best fabric!! Thanks Karen: hope you find that melton soon. If I spot some I will let you know! Your coat is such a statement piece. And that collar is really retro too. Ooo, your coat is gorgeous! I absolutely love the big collar. Thanks Lynne. It really is a fairly simple pattern for such a statement coat. 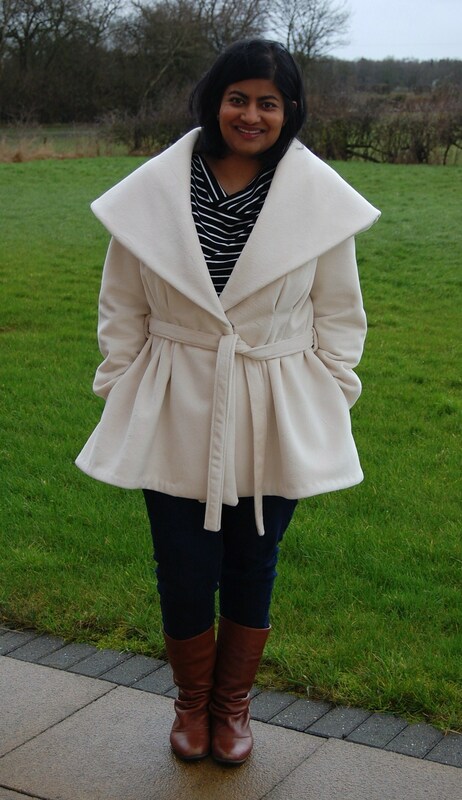 The big collar is fab and really makes this coat stand out. For a simple/easy pattern, this coat has the wow factor. THIS is the kind of jacket that I’m going for: something cuddly to cocoon in! Thanks for showing us what it looks like in a stiffer fabric. This pattern is on my Wish List, and I plan to place an order today.